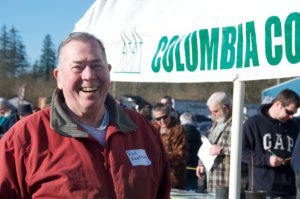 St. Helens, Ore. – A red-letter day for Columbia County Small Woodlands Association (CCSWA) was Saturday, March 10, 2018. 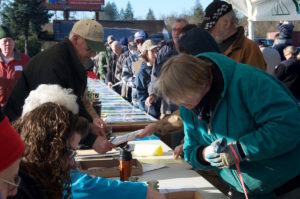 They sold some 20,000 of 20 kinds of trees at their 20thannual tree sale. Buyers included private citizens, nursery men and women and fellow small woodland owners. Customers stood in a long line waiting for the sale to open just to make sure they got their choice of conifers (by the tree or in bags of 120) or deciduous trees (divided by fall color, flowers and fragrance). The sale continued until the trees were gone. 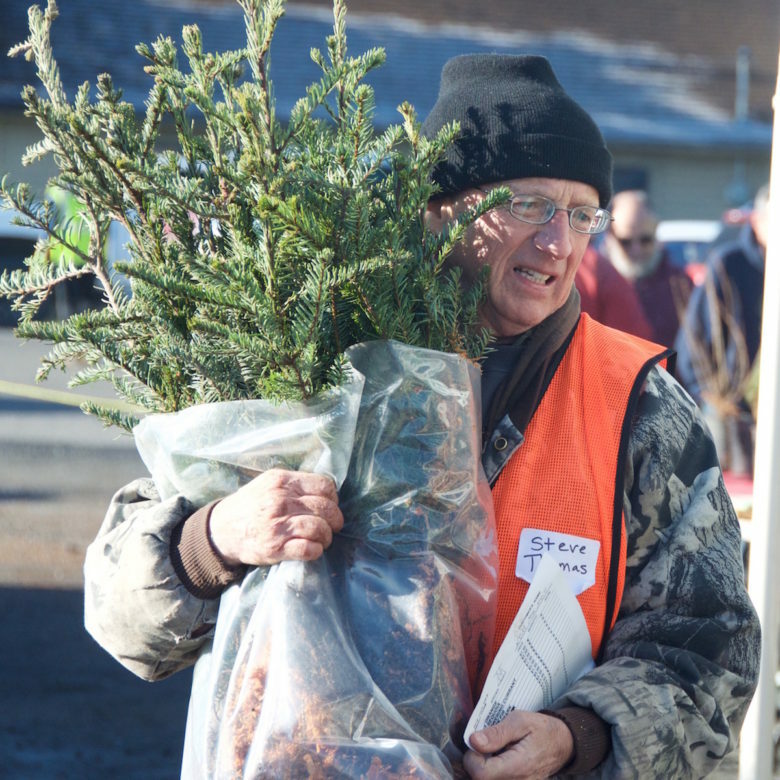 Rod Nastrom managing the Columbia County Small Woodland Association annual tree sale. The all-volunteer organization spends the bulk of their earnings supporting member landowners in what’s known in the industry as best management practices. These practices include, but are not limited to, promoting wildlife and recreation, producing fiber and safeguarding water. 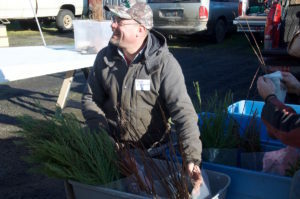 Rod Nastrom, owner of Nastrom Needles Christmas tree farm in Warren, Oregon and the guy who orders the trees and manages the sale, was pleased with this year’s event. “They started lining up well before we opened and it went on like that until the trees were gone,” Nastrom said. “In fact, we even issued some credits to buyers who couldn’t get their orders filled. The first to sell out is always the Douglas fir, followed by Western Red Cedar and then the Noble. Organized with information and a live samples. CCSWA’s membership base represents individuals, families and other Columbia County tree-growing property owners who own between one and 5000 acres of land. Paul Nys, an Albany educator who retired to his hometown of Rainier, is a small woodland owner and one of the founding CCSWA members. A distinct feature of the annual sale is the finely tuned organizational system created by Paul and his wife Judy. Dan Kloppman ready with a customer order. “Twenty years ago, an extension agent, told me that we (CCSWA) should be selling trees,” Nys said. “Judy and I sat down and wrote out what we would need, how it would all work and how many volunteers it would take. 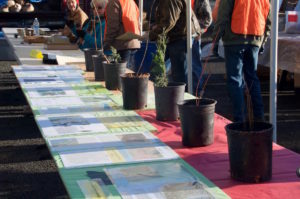 We started by selling conifer seedlings to members and then added the deciduous trees in a second tree sale for the public. Over the years, CCSWA members have worked a lot with Columbia County School students. They took all of the fifth graders to the World Forestry Center in Portland, promoted grants for teachers and helped kids establish native trees in riparian areas. The organization also hosts an annual tree farm tour that’s open to the public. This year, the event will be held at Dahlgren’s Tree Farm. For more information on Columbia County Small Woodland Association, contact Paul Nys at srnysguy@opunet.com or visit Oregon Small Woodland Association at www.oswa.org.